One of the most popular new characters on television today, Daryl Dixon is a survivor. An expert hunter, tracker and scavenger, he and his brother Merle initially join Rick Grimes’ band of survivors in order to rob them of their supplies. However, circumstances keep Daryl in the group, and over time he transforms from a loner to a “go-to” leader, taking responsibility for the safety of his new-found family with his crossbow. Straight from the screen to your shelf, Gentle Giant Ltd. is proud to bring you the roguish Daryl Mini Bust. This beautiful and intricate bust is digitally sculpted and cold cast using only the highest quality synthetic polyresin. From Daryl’s signature sleeveless tee shirt to his deadly hunting crossbow, no detail has been overlooked. 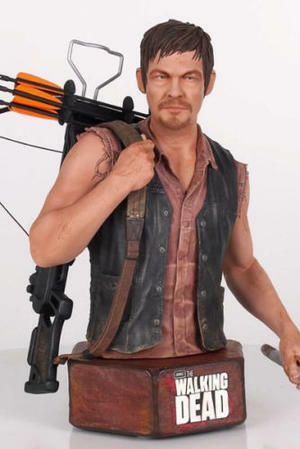 Order this bust directly from Gentle Giant Ltd. and receive a BONUS accessory – a string of zombie ears for Daryl to wear! A limited edition collectable, each hand-painted bust comes individually numbered and includes a matching certificate of authenticity.